Covermark is an expert brand in advanced dermocosmetics. We export to over 80 countries a product portfolio with a glorious history and a continous expansion throughout the years. Our new website will be coming out shortly. In the meantime, you may browse through our product catalogue. The first camouflage foundation ever! The only one to win a US patent! The ideal solution to cover skin imperfections on face and body! Recommended throughout the years by dermatologists and make-up artists worldwide! They treat as skin care, they dress as make-up! Skin whitening revolution: specialized treatment for each ethnic-type of skin! For a bright, healthy complexion full of light, without spots and blemishes! » even on cellular level! Based on the Nobel-prize winning discovery of aquaporines! All-day lasting, prestige sun protection for the face! Versatile, masstige sun protection for the body! 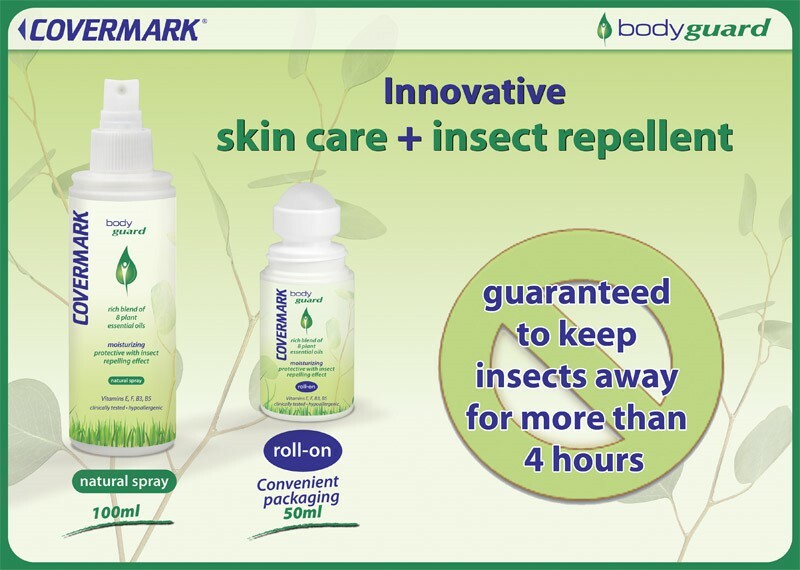 Soothes the skin, while it guarantees to keep insects away for more than 4 hours! Copyright© 2014-2015, Farmeco S.A. Dermocosmetics - All rights reserved.